Guess what I’ve been doing lately? Yep, designing grad cards. Graduation will be here before we know it! Photography and design by Joyce Meyer. Two images blended using Photoshop CC and topped off with Topaz Studio “Dreamy Day” action. Fun holiday tradition located in Madison, Minnesota! Albergue included breakfast for a fee so arrangements had been made for an early start to try and beat the afternoon heat. The number of pilgrims has increased substantially since Tui, so the odds of scoring beds, especially bottom bunks, appear to be slim to none in Pontevedra. Thus, we have a reservation at a hostal across the street from the public albergue. No worries today. A large grocery store is within walking distance so the evening meal consists of lettuce salads and pizza washed down with wine, all consumed in our cozy little room. Absolutely no available beds to be found in the next destination of Caldas de Reis so it’s early to bed ~ tomorrow will be an epic bed race for the 50 municipal albergue beds listed in the Brierley book. Can we do it? Camino Portuguese Day 9 ~ Welcome to Spain! Tuesday, August 14, 2018: Excitement fills the air as we make our way from Portugal to Spain. The albergue in Pedreira was kind enough to pack a breakfast for us the night before since we are leaving well before sunrise. Crossing the border on the bridge over Rio Minho from Portugal to Spain. We arrive at our destination city, Porrino, and proceed to get lost. Oh, well… we wanted to complete some extra credit hiking today, anyway, to cross over the 30 kilometer mark. 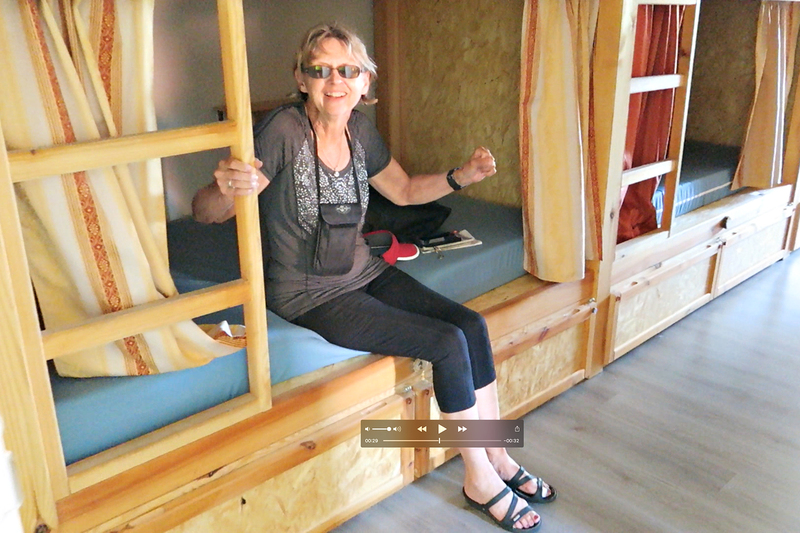 Senda Sur, Porrino, was a great albergue with super bunks, nice showers/bathrooms. The small kitchenette facilities were quite basic, but all we need is a way to heat water for instant coffee in the morning and we’re happy! The long, dark, narrow bunkhouse reminds me of a railroad car, so I kind of expected it to start moving. Nice hotel rooms are close by and we enjoy visiting with a delightful Brazilian/Netherlands couple on a working vacation, along with their daughter, and two young German men. I take the night off from taking photos/videos and now I’m kicking myself! Camino Portuguese Day 7 ~ So Tired! Oh, so tired today. Ponte de Lima festival included loud music from midnight to 3 a.m. this morning. The albergue balcony with open windows, due to the heat, allowed all of us in our section of beds to feel as though we were part of the fun and merriment. Style of music was not the lullaby kind and the tremendous fireworks show after was lengthy, as well. Thus, little sleep, but that’s o.k. Warm temperatures today plus we climb the largest hill on Portuguese camino. By the looks of the photo above we tackled it like beasts! All rocky sections are compared to the Loch Lomond section along the West Highland Way and this was not as challenging. Beautiful views, but we must hustle along as we hope to score beds (bottom bunks) in the 5 euro Albergue de Peregrinos in Rubiaes, Portugal. Yeah!! We arrive in time… Our home tonight is an old school converted to an albergue filled with bunk beds, well supplied kitchen, large dining area and outside patio/laundry area complete with clothes lines strung across the sunny yard. Albergue de Peregrinos is an old school converted to house Camino pilgrims with rooms filled with bunk beds, well supplied kitchen, large dining area and outside patio/laundry area complete with clothes lines strung across the sunny yard. Chilling in the patio area outside, we meet a tall man from South Korea who has completed the whole Camino Frances from France to Finisterre, Spain and immediately started walking the Camino Portuguese backwards from the coast. His current unemployment status has given him time for this lengthy endeavor and by now he can cover a tremendous number of miles each day. While you may be tempted to look at this as a mid-life crisis situation, I would prefer to see it as an opportunity for personal growth. To each their own, right?